For Ladies and Gentlemen, 21 years and older. No experience necessary - Daisy will demonstrate step by step instructions and you will be on your way to a beautiful piece of artwork! The evening of February 11th a special Couples Wine & Paint. You and your partner will create one piece of artwork with 2 different canvases. 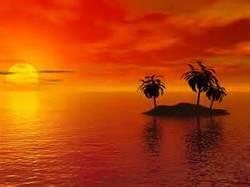 We will be creating this beautiful sunset. This is a beginner class and all art supplies are included. $50 a couple. Dress for mess. Class begins at 7 pm and will be finished by 10:00 pm. Questions? Reach out to Daisy directly via this link. Register at least 7 days prior to the class to avoid cancellation of class.